Southern Highlands provides numerous option for an active lifestyle including acres of parks, tennis courts, ball fields, recreational facilities, and lots of open spaces. There is something for everyone of all ages. If you enjoy walking, hiking, or biking you will enjoy the great trails system with exquisite natural desert surroundings. Southern Highlands real estate is a beautifully developed community among the exclusive Southern Highlands Golf Club. Nestled within and surrounding the golf courses are some of the most beautiful homes for sale in the valley. 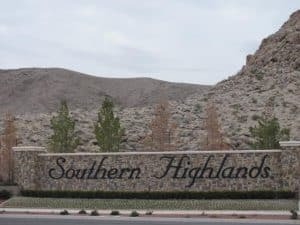 Southern Highlands is located in the Southwest Las Vegas. If you head south on Interstate 15 and take the St. Rose/Southern Highlands exit you will be there! Southern Highlands definitely knows that everyone likes to be pampered and because of that, it has its very own spa! The Spa at Southern Highlands within the golf club is also exclusive and caters to the person who enjoys being taken care of and rejuvenated. Southern Highlands homes for sale Las Vegas zip code is 89141.